That’s my fourth day, which to my surprise turned out to be a Wednesday and not a Saturday, meaning I was able to contemplate a much better train home. And as I said to Daniel Hahn when I waylaid him on his way in, having just the one event felt positively holidayish. 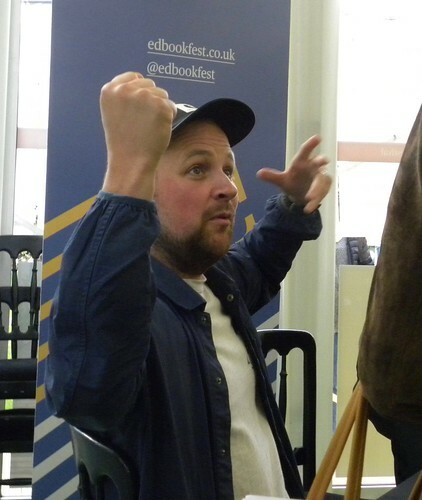 We exchanged fond memories of an event at Waterstones piccalilli three years ago, which Daniel seemed to remember even more of than I did. I was there ‘early’ because I’d agreed to meet up with Toddler Tollarp and his mother. So we had a couple of hours chatting about everything under the sun. Almost. Unfortunately for TT, he slept through most of it, not even getting cake! Sitting in the greenhouse watching the bookfest world go past, I saw Beverley Naidoo and Jackie Kay. Later on as I checked my train timetable outside the yurts, Nicola Morgan ran past, but I knew she was in a hurry, so didn’t run after her. It was a pleasant afternoon, which meant lots of people were enjoying drinks on the yurt decking. Saw Alan Johnson and Allan Little walk to their event. Strolled over to my lone event with Melvin Burgess, Steven Camden and LJ MacWhirter, who were talking to Agnes Guyon. Chatted to friendly, but hungry, lady in the queue, who had a poetry tale to tell. Those are always the best. Afterwards, I had my good train home in mind, so made sure the photo session in the bookshop was swift, and I didn’t stop to chat. So you know what happened then, don’t you? The train was late. 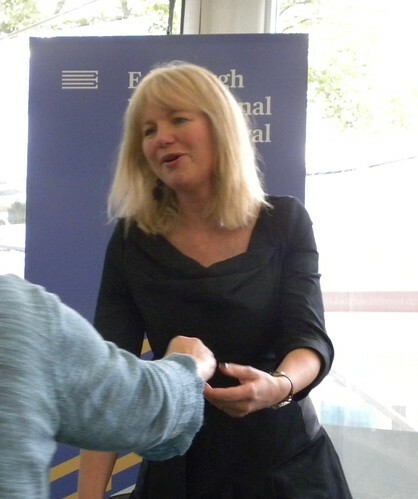 It’s short and sweet, the schools programme at the Edinburgh International Book Festival. ‘Making books more affordable’ is a good motto, I feel. May it be successful and reach the children who need it the most. I know I shouldn’t read the programme and plan, but I can read it and think. Some of the authors on the schools list will be doing ‘normal’ events too. And there is always the perfecting my school appearance. One of these days it will work. Last year someone I’d just met talked very enthusiastically about Jason Reynolds, whom I’d never heard of. Well, this American is coming over, for an event with Chris Priestley who has illustrated his book. That should be pretty special. Clémentine Beauvais is someone else I’ve not seen before, and she will be appearing with Sarah Crossan, which will be good. James Mayhew I have always managed to miss, so I could perhaps undo that, and Melvin Burgess, whom I’ve seen a lot, is coming back after a break of a few years. Or did I merely miss him? Ehsan Abdollahi will return, which pleases me, and he’s appearing with Eloise Greenfield. I’ve not seen Beverley Naidoo for years, and I don’t know her events partner Marjan Vafaeian at all, which I hope can be remedied. I will quickly tiptoe past the ‘star attraction’ on the Thursday morning, to mention that the last day will be special as always, with people like Theresa Breslin and Philip Ardagh and lots of other fun. As you can tell, many school children will have some great events to look forward to. I’m always in awe of the school groups who get up before dawn cracks, to travel across Scotland to come to one of the events. Hopefully it will be a memory for life, and be the beginning of a bookish future for some. Or ‘how to fail at getting Daughter to read’. Something. Anything. She went on a Geology field trip to Anglesey last week. So obviously they were going to spend lots of time staring at rocks. And other geological things. But you just never know what you might want if you wake up in the middle of the night in a strange place. Or if your room mates are boring. Nothing girlie. Not too long. Not scary. I dug out twelve contenders to share with the waterproofs and thick socks. They were: Between two Seas, Burn my Heart, Chains, Crossing the Line, Halo, Hootcat Hill, Ondine, Revolver, The Cat Kin, The Night of the Burning, Time Riders, When I Was Joe. Having lined them up (sorted according to colour of the covers) on the piano, we met and she pruned. Oh how she pruned. Too pink. Too chavvy (cover). Scary dragon. No. Don’t get it. Too political. No. No religion. Prefer to read this at home. (!) Don’t think so. Then it was down to two. Halo and Between Two Seas. Hard choice, but Between Two Seas ‘spoke’ to her. So this historical tale set in Jutland was the one that got squeezed into her bag. The one she would have read, had she read a book there. Let’s return to my bites after a bit of a bite break. Had this link sent on by Beverley Naidoo. Her book Burn my Heart has been dramatised by the Trestle Theatre with Blindeye, and they will tour theatres up and down the country for a couple of months, starting on September 21st. Not enough of the upping and downing for my taste, since they have cut a wide circle round anywhere near me. Burn my Heart was one of my very favourite books a few years ago. 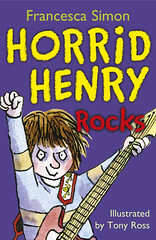 If you want to read about Horrid Henry and his beloved band the Killerboy Rats, then Horrid Henry Rocks is out now. I trust that none of you would prefer Perfect Peter’s Daffy and her Dancing Daisies? Francesca Simon was in Manchester on Friday, or so I’ve been led to believe. Before exhaustion hit, I’d fully intended to pop along, but I can tell you that very little popping will be done for a while. It may be pink, but it’s still about reading. Voting for your Queen of Teen is open until Thursday 9th September. I can’t tell people who to vote for, but there are a few good ones on that shortlist. Think pink. Or not. Then a final begging paragraph on behalf of Donna Moore, on behalf of a worthy charity (the Grandfather used to be involved with it). 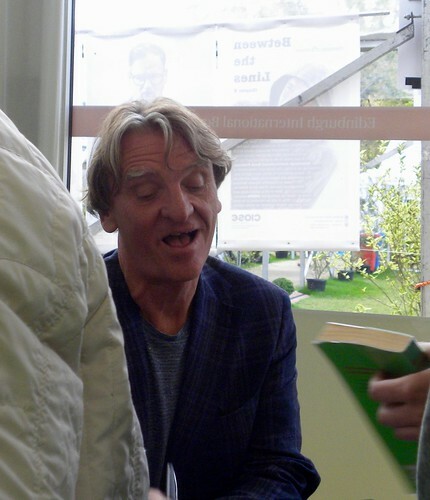 Signed books from authors, or possibly signed – or even unsigned – books from non-authors, to put in a raffle. Donna, of the floral Doc Martens, is feeling self-conscious donating her own Old Dogs, and is hoping her book can hide between lots of others. Old Dogs has nothing to be ashamed of! But there is no harm in more donations. I might go and see if I have anything to donate. Perhaps I wrote and published a book without noticing, that I can sign and send? Once, when we got our first computer (and let me tell you that was a while ago), I had this idea that that was it. Once and for all. Hah, is what I say today, many many computers on. Maybe that’s how people felt about getting themselves a website, too? Now the time has come for many to revamp, just to avoid looking dated. Mary Hoffman has recently given hers a facelift, and it’s definitely spring now. What with words like tweet and twitter, the countryside feel to Mary’s home page makes me think of ‘back to nature’. Mary has also changed her newsletter style blog, and it looks as if her old news blog is no longer in use. 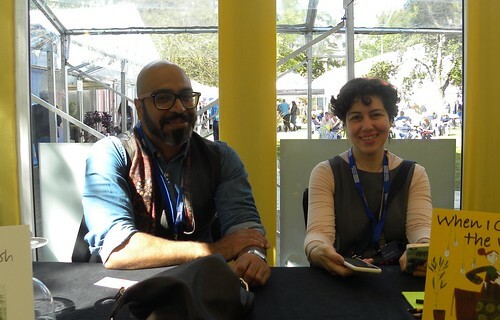 Candy Gourlay has been to the London Book Fair and has written several posts about what she and her author friends got up to. By the sound of it, they rather took over the place, seeing as the lack of planes made for an emptier than usual fair. Wish I’d known. I love empty spaces. I could have set up my own Bookwitch stall. Just think. Nicola Morgan launched her new blog, specifically created for her new novel Wasted, yesterday. There are a number of enthusiastic comments/reviews of Wasted. Me, I wouldn’t know. But there is a reason for that. Cough. “Learning through Literature: A South African Story”, Celebrating 25 years since the publication of Journey to Jo’burg, by Beverley Naidoo. Michael Rosen with Chris van Wyk, Njabulo Ndebele, Gillian Slovo, Ret’sepile Makamane and Beverley Naidoo. And who wouldn’t have wanted to be there for that? I did. But for some reason Virgin want payment for their train tickets, and in this instance rather too much. I just hope it was as good without me as it would have been with. Beverley’s books are fantastic. I blogged earlier – I think – about how hard it can be to know what you don’t know. I’ve found one more thing I had no idea I didn’t know. Barrington Stoke. I didn’t know they specialise in books to help struggling readers to read. I just thought they were a publishing company among many other publishing companies. Not so. But why did no one tell me? ‘That’s one of my Barrington Stoke books’ authors would say when talking about something they’d written. And I simply assumed that this particular book was with a different publisher. Now it all makes sense! I have just been sent a sample Barrington Stoke book, along with their catalogue, and both make for good reading. 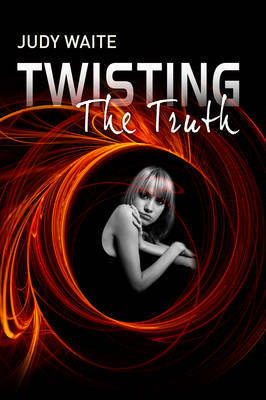 Twisting the Truth by Judy Waite was for me a very quick read. But it’s good. Whenever I come across such brief stories, they are usually also more childish, whereas this is for 14+. It must be horrible to be in your mid teens and only have babyish books to choose from. Much easier not to read at all, I’d say. And that’s what they do, which is such a shame. I recall coming across some similar books at Offsprings’ school library, except they were abridged versions of ‘real’ books. That’s another way of approaching reading, obviously. But I can see that having something written specially might be nicer. So, Judy Waite’s story is about a girl who lies to her stepfather when she gets home late. She comes up with a tale about having been abducted, almost, on the way home. As with all lies, this leads to a situation she could not have foreseen. Very exciting. The Barrington Stoke catalogue is full of books that I don’t need to read, because I can read longer books, but so many of them look very tempting. And I can see how almost anyone with dyslexia could be turned into a reader this way. I’m fairly sure that Adèle Geras has one or two BS books under her belt, and I know that Theresa Breslin told me that the ‘Alcatraz book’ of hers I’d come across was a BS one. It is. I found it in the catalogue. I also found lots more of my favourite names in there, like Philip Ardagh, Malorie Blackman, Frank Cottrell Boyce, Terry Deary, Bali Rai, Anne Cassidy, Tony Bradman, Lee Weatherly, Beverley Naidoo, Oisín McGann, Catherine Forde, Joanna Kenrick, Hilary McKay and many more. Many more. ‘All’ that these writers have to do is come up with a great story, with short paragraphs and short chapters, and Barrington Stoke will print it on cream paper in their own clever font in a good size. But only once the book has been tested by test readers, of course.